Most people who have birds in the family have pet parrots. And because they are indeed birds, most female parrots are completely capable of laying eggs. This is a fact whether or not they breed with a male. Many birds in captivity do not lay eggs because the conditions that support the egg laying must be right. If there is no place to lay them such as in a small enclosed space like a box, they simply aren’t going to lay any eggs. Due to the lack of nest holes in trees, birds in the wild simply aren’t laying very many eggs or raising the number of babies that they used to which accounts for the depleted wild populations. There must be pretty precise conditions in Nature for parrots to breed. They must have enough food and water, they must have a safe place to lay their eggs and incubate them and they must be able to remain there in order to care for their hatchlings until they learn to fly. 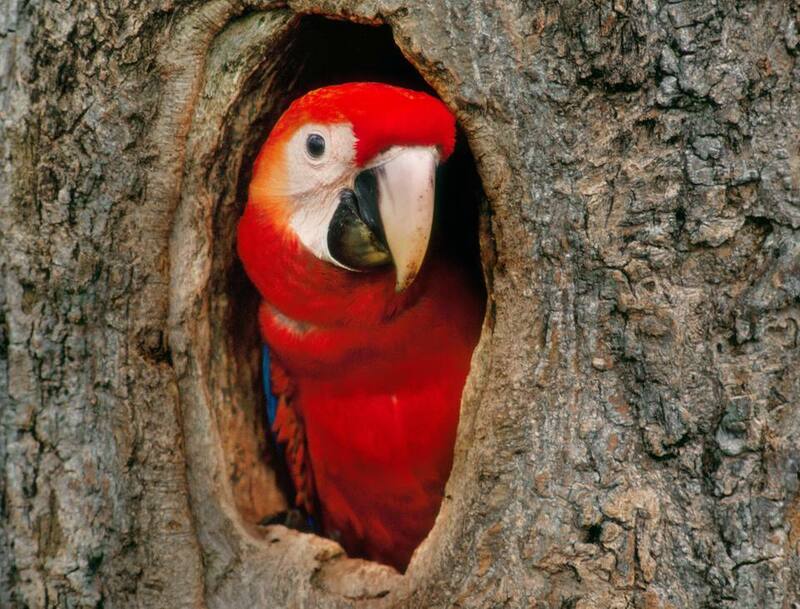 A tree hole is perfect for a parrot because with the exception of Quaker parrots, they do not build nests or homes of any sort. They must find a naturally formed hiding place to raise their young. Many people have smaller birds that lay many eggs when they come into breeding condition. This can be hard on their health because the egg laying requires a depletion of calcium in order to for the egg shell. Nevertheless, female birds simply do what comes naturally and lay eggs. Along with the urge to lay eggs and the subsequent production of those eggs comes a behavior that is necessary to keep those eggs viable until they hatch. Once she lays all of the eggs she is going to lay, the Mother must be ready and willing to sit on those eggs for an extended period of time to incubate the eggs as well as care for the babies that hatch. Imagine being told by your doctor that you must spend the next thirty days in bed. You can’t leave except to find food and you must persuade your spouse to lie in bed until you return. This is what the female is up against. So Mother nature helps her out by putting her in the frame of mind to be content with this state of affairs. This “broodiness” is brought on be the secretion of a hormone that causes this behavior desired by Nature. The incubation period where the Mother must remain on her eggs varies from species to species. This “broodiness” is characterized by Mom sitting on her eggs and getting aggressive if anyone approaches her or her clutch of eggs. Chickens will often pluck feathers from their chest right where the eggs would be underneath her so that her warm skin is in contact with the eggs. This bare spot on the hen’s chest is often called a “brood patch.” Some females of certain species will automatically shed those feathers on the chest area, but others will pull them out on their own and line their nest with them. Chickens will use the plucked feathers as an insulation for their eggs and it also serves as a padding. Broodiness can also be brought on by warm weather, long days of sunlight, the availability of a small dark space and nesting materials such as paper or a blanket. The presence of a male may also swing your female into breeding condition as well as laying eggs and beginning broodiness. One of my female African Greys decided to present me with two infertile eggs over a six day period. What caused it? My hunch is that fact that she had a box in her cage as well as a phone book that she liked to chew on. One of my other African Greys is a male and his presence probably didn't help matters any. So I had the perfect conditions set up for her to lay eggs: it was breeding season, she had a small enclosed space, the days were getting longer which provided more sun, she is on a great diet and a male was in the same room. I simply let her have her eggs for about a month and quietly took them away while she was on her play stand eating. When I returned her to her cage she looked around for a few minutes and then simply went on with her day. I think she was relieved that they were no longer there. Within a day she was back to normal. I also removed the box which was banished to the trash, never to return to her cage. This nesting instinct is crucial in maintaining the species as the diligence of the mother during the incubation period is necessary to hatch the babies as well as care for those helpless babies when they come into the world. It’s a long process and the brooding mindset caused by those hormones is what allows birds to procreate.